While intrinsic causes of hydronephrosis are encountered in young children, CRV is observed at a later age of children or young adolescence period. Hydronephrosis detected on antenatal ultrasonographic evaluation or urinary tract infection at the early months of life leading to diagnosis of UPJO is mostly due to intrinsic causes. Later, diagnosis occurs after a work-up of symptoms such as flank pain, nausea and emesis, or urinary tract infections, which is mostly due to CRV. Our experience also indicates that infants present with an intrinsic ureteric obstruction, older children with a late presentation have a greater likelihood of having CRV. As a conclusion, we can say that increased age and the presence of pain at presentation with hydronephrosis is a positive predictor of CRV, while antenatal diagnosis is a negative predictor. The evaluation of a hydronephrotic kidney begins with renal sonography. A nuclear medicine renal scan with an added diuretic phase (e.g., mercaptoacetyltriglycine, diethylenetriamine pentaacetic acid) is a valuable adjunct to determine the significance of renal pelvic dilation in terms of functional compromise. 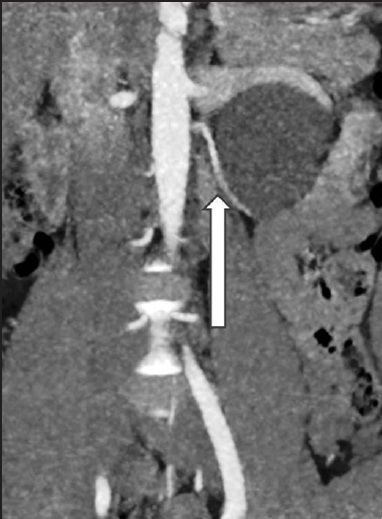 In addition to these imaging modalities, computerized tomography (CT) scan of the abdomen/pelvis [Figure 1] and an intravenous pyelogram were valuable, but the high risk of radiation in these techniques is abandoned. Nowadays, functional magnetic resonance urography (fMRU) gains popularity at special institutions. While nuclear medicine renal scan provides relative function and drainage, fMRU offers the advantage of vertical integration of the anatomy with functional information. 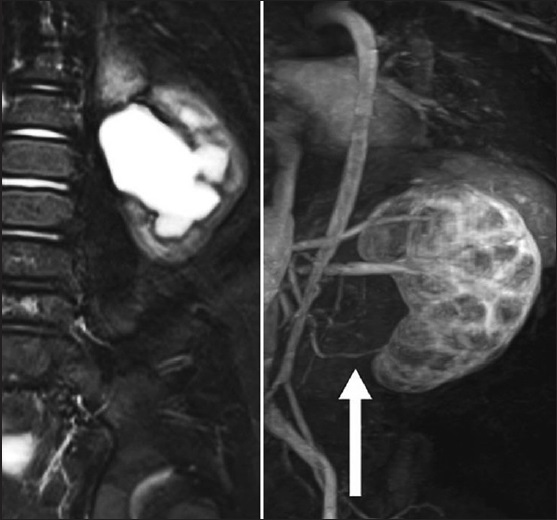 Anatomic imaging by fMRU may also help to identify CRV [Figure 2], if radiologists warn about this entity since it is not specifically protocoled to identify the renal vasculature. The incidence of CRV is reported to be 6-11% of the pediatric population. , However, it is thought to increase this rate with an increased usage of fMRU in hydronephrotic children. Detection of CRV before surgery may also be useful for surgical planning. Obstructing crossing vessels can lead to failure of surgical treatment when an endoscopic approach, such as endopyelotomy, is chosen. In addition, CRV can be injured leading to significant hemorrhage in this procedure. The best choice is dismembered pyeloplasty techniques in the surgical management of patients with CRV. This technique would involve excision of the narrow segment of ureter and transposition of the CRV behind the UPJ. In the Hellstrom technique, after mobilizing the CRV, the adventitial tissue around it is pexed to the pelvis at a higher level. Chapman technique involves taking sutures on both the sides of the vessel on the pelvis and hitching it up. This procedure can be done without any drainage and is quicker to perform than dismembered pyeloplasty, open or laparoscopic. CRV compressing or distorting the UPJ may be the sole cause of ureteral outflow obstruction or may coexist with other causes of UPJ obstruction. It is recommended that the presence of CRV is routinely determined preoperatively in cases of UPJO which can affect the surgical management choice. Although CT angiography can be used in the detection of CRV, fMRU has some advantages of displaying of the anatomy with functional information and showing CRV. It should be kept in mind that failed surgery requiring a redo-surgery is a consequence of missing CRV during pyeloplasty. Weiss DA, Kadakia S, Kurzweil R, Srinivasan AK, Darge K, Shukla AR. Detection of crossing vessels in pediatric ureteropelvic junction obstruction: Clinical patterns and imaging findings. J Pediatr Urol 2015;11:173.e1-5. Calisti A, Perrotta ML, Oriolo L, Patti G, Marrocco G, Miele V. Functional outcome after pyeloplasty in children: Impact of the cause of obstruction and of the mode of presentation. Eur Urol 2003;43:706-10. McCreadie C. Results of treating hydronephrosis by the Chapman technique. Proc R Soc Med 1968;61:1142-3.